This book, written by Pastor Mark Kai Nilsen, is birthed out of a story that has become so familiar among churches. The Pastor feels tired, trained burned out. He winters around with his spirit diminished and his relationships drained. Even though he appears to have it all together, on the inside his energy has been completely drained. This was Kai Mark Nilsen’s story – and it’s the story of hundreds of pastors (and Christians!) all over America. Nilsen takes us back to the creation story in order to discover the gracious energy that God has for his children. Through the creation story we see many sources of God’s energy that are available to us: 1)Grace, 2)Possibility, 3)Paradox, 3)Natural World, 4)Relationships, 5)Relationships, 6)Fruitful Work, and finally 7)Rest. Each of these “creative renewable energies” receive attention in each of the respective chapters. These energies give us the power to live life to the fullest and to truly love others as God has called us to. They also are unending because God’s grace towards us is unending. Throughout the book Nilsen stresses that there are no such thing as quick fixes. Often this renewal of energy takes time – its gradual – and its often difficult. He also stresses the fact that renewal can never happen on the basis of our own energy – in other words you can’t pick yourself up by your own bootstraps. One aspect of the book that I really enjoyed – and I know will be super useful for small groups and for individuals going through the book is that there are a series of “essential life questions” for each chapter. These questions help the reader process what they are reading. They are questions that are very practical and if taken seriously could lead to major life change. Also, each chapter is tied to a specific spiritual discipline. Some of these disciplines are pretty traditional – like solitude or bible memorization or spending time in nature. Others are pretty unique. Either way – they are helpful in directing the reader to spend time with the Lord. Overall I really appreciated this book – for me it came at such a good time. I have a million things on my plate right now – I’m full time at the CATS program at Fuller, doing full time ministry, taking the lead on planning two international mission trips within the next three months, and publishing tons of stuff. So right now – I’m swamped. 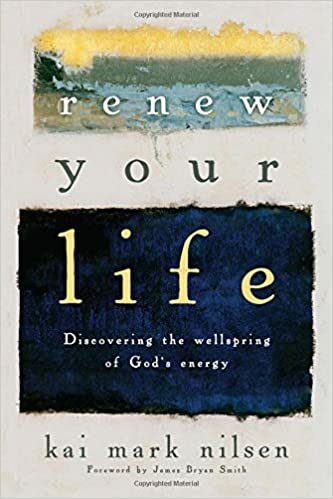 And a few weeks ago it all just hit me like a brick wall – I realized I don’t have the energy to sustain this long term this book reminded me that maybe I don’t need to have the energy. I need to let God give me that energy because he is the infinite energy of grace. Note: I received this book courtesy of the publisher in exchange for an impartial review. Previous Previous post: What is the Most Important Work of Theology Written in the 21st Century?